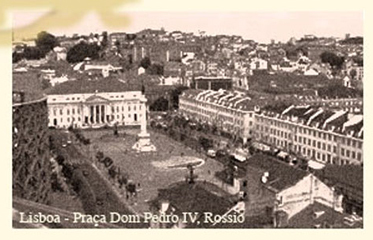 Praça Dom Pedro IV, popularly known as Rossio, is an attractively paved square and has been the nerve centre of Lisboa for six centuries. It was a stage for bullfights, festivals and military parades throughout the years. On the north side stands the Teatro National Dona Maria II, and in the centre a statue of Dom Pedro IV, the first emperor of Brazil. Image bellow is the reconstruction of the postcard that was in my collection when I was really young. 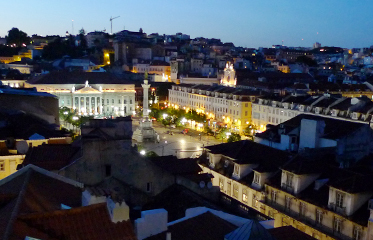 It was this image that triggered a lot of emotions when I visited Rossio for the first time. I believe that this post card is responsible for my hunger for travel! In 2006 flat image of this square was used for creating "Language of urban Squares" series. Inscription was added, in this case, "City is nothing if you do not interpret it with passion", in colour on top of duotone photo. This printout, 152x52cm, was commissioned by Seneca College art collection. Our new visit to Rossio was in March 2017.